Porchetta international shipment prices. 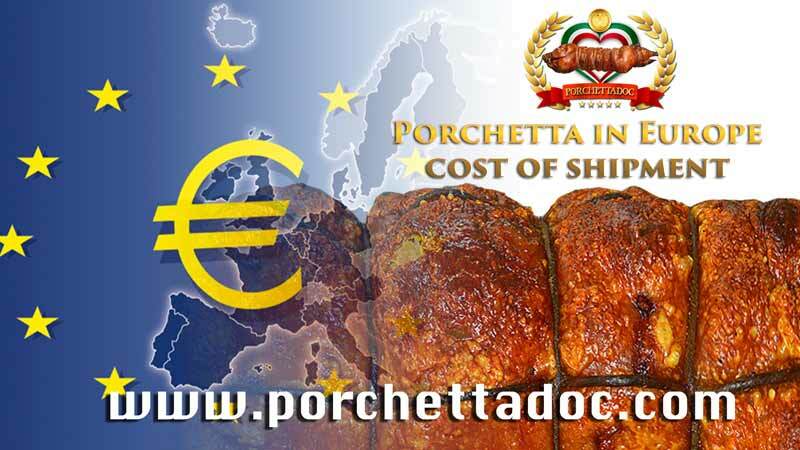 If you are euro citizen, and you would like to purchase authentic Italian Porchetta, you can buy our products and receive them straight to your address, even the “porchetta” with international EMS shipment. To receive a Italian Porchetta, a fatty savoury roasted pig, it’s easy and fast, by arranging a international euro shipment across the continent via EMS, it wll arrive at your door in 48 hours. Our products following the best Italian tradition, in particular the one of Ariccia a city near Rome in central Italy, where the porchetta PGI born in our artisan laboratory. All our products are OGM free and the pigs are coming from a secure farm in Umbria ( Perugia). Cost of shipment via EMS are below, we will do our best to reach every part of europe in 48 hours are expressed in euro and does include delivery and packaging.